Start of the Rim Rock Trail from the Overlook at Smith Rock State Park. 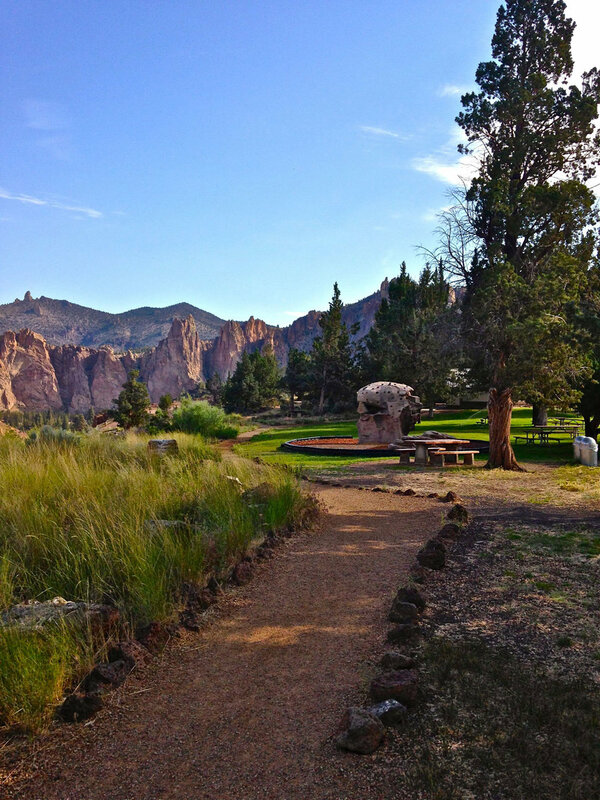 Rim Rock Trail along the picnic and play areas at Smith Rock State Park. Viewing bench for seeing rock climbers, wildlife, mountain and canyon views along Rim Rock Trail at Smith Rock State Park. Continuation of the path away from the main climbing view area toward the campground at Smith Rock State Park. Signage along the Rim Rock Trail at Smith Rock State Park as you approach the path to the campground. Path to the campground at the end of the Rim Rock Trail and intersection of Rope-de-Dope Trail into the canyon at Smith Rock State Park. NOTE: Horseback riding is not allowed on the Rim Rock Trail. From the Welcome Center and Native Garden, wind to the left along a gravel path that overlooks the river canyon below. You can picnic at nearby tables, and have the kids play on the Monkey Face climbing wall. Or save it for the way back to hang out in a shady area before driving home. Strategically placed park benches allow you to observe the climbers on Christian Brothers, The Dihedrals and Morning Glory Wall. You can rest while they provide the show. Pack some binoculars and you can get up close and personal with the rest of the wildlife too. Geese and birds of prey use the gorge as a food corridor and path to their nesting areas. As you keep winding left you see Asterisk Pass, marked by a boulder resembling Woodstock from Snoopy comic strip fame. The Smith Rock Group with Phoenix Buttress, another popular climbing area, lies just beyond the horse ford. On summer days you may see them crossing with their riders when the river is lowest. Hang a sharp left at the junction to return on a loop that you pick up by the RV parking lot. It rejoins the main trail you came up on and takes you back to the Welcome Center. Want to go down to the canyon? Stay straight at the junction for .14 miles, and it takes you to the Rope-de-Dope Trail. Hang a sharp right and go down into the park, or continue straight to go into the campground Bivy area.